Albeit even basil leaves are also used for mouth ulcer but it doesnt appear to be one. I am almost sure it is 'Basale Soppu' or Poi. Omam or Ajwain...hope I am right. Are you growing it in your garden? 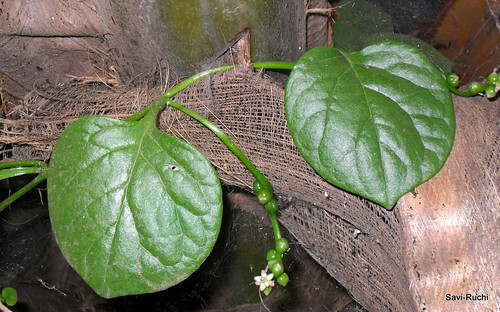 It's malabar spinach, also known as mayalu in Marathi, poi in Gujarati and vali in konkani. Is that correct? Vali bhajji in konkani, basale soppu in kannada! Its called Pasalai Keerai in tamil right?It gives out purple tiny fruits.We had this plant in our garden when I was a kid. Don't know about ulcers- but looks like betel leaf or "paan" to me. I think it's Malabar Spinach or MaayaaLu in matathi . Thakkali keerai, you mean tomato leaves!, no dear..
Sari uttara.., you all are right. sari uttara. Here is a BIG SMILE from me as a gift. Visiting your blog for the first time. Nimma recipes collection chennagi ide. I live in Singapore too. Nimge time sikkaga mail maadi. We shall get in touch. We call it kodi pasalai Tamil, literally vine-spinach, those little seeds on those vine will turn from green to deep-purple color upon maturaton , right.